The first two days of a longer voyage are always the hardest. You have to get used to constantly being in motion, having to hold on to something at all times and staying up half of the night. All you really want to do is sleep; there is not much interest in anything else and the night shifts take forever. On day three some kind of routine has been established and you feel more inclined to do something productive, like taking a shower, making more fruit salad, or fish, for example. 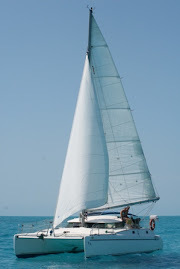 sea was as comfortable as it gets, while still being "sailable" and we both enjoyed the ride. We did have to run the engine for a bit to charge the batteries, a necessary evil, but easier than rigging our little generator up. Because of the light winds, we wanted to fly the spinnaker as long as possible during the day. Just as I finished up the dishes and we were ready to take the sail down, a squall surprised us with some wind and lots of rain; the exact situation you try to avoid when the spinnaker is in place (and the reason we take it down at night)... With fluky winds, it might end up in the water, where you can run over it, or in heavy winds, it might rip. In this case, we saved it from dipping in the salty ocean and managed to take it down. Everything - us included - was soaking wet, and enjoying turned into annoying. The wind never restored itself and with the jib instead of the spinnaker we lost speed regardless. During Mark's shift, we moved 10° off course at 4 knots. At midnight, it was my turn at the helm and I was welcomed by a radar screen cluttered with squalls. One rainstorm after the other arrived, sucking out the little wind we had. For hours I sat in the rain and wished for the wind to come back. Floating on an ocean doing less than 2 knots is frustrating to say the least. Not only are you not making any progress, but - no matter how calm the sea - the incessantly flapping sails and erratically banging rigging would drive the most patient person crazy! Plus, no sleep for the person off watch either.